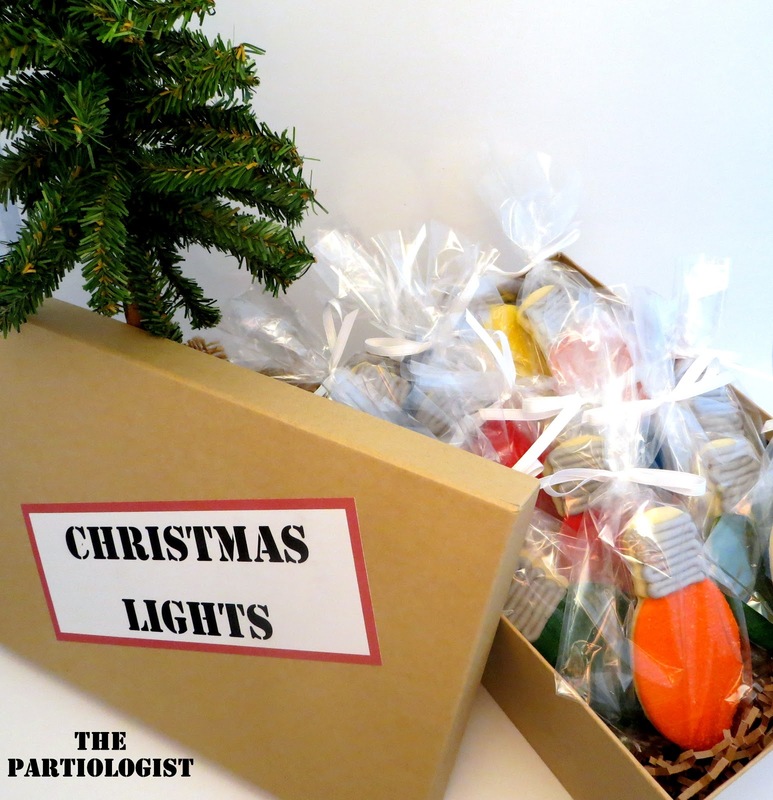 The Partiologist: A Bright Idea! Give the gift of ready to bake and decorate cookies this Christmas. Just fill the plastic Christmas ornaments with decorating sprinkles, add dough and you'll have the perfect gift ready to go. 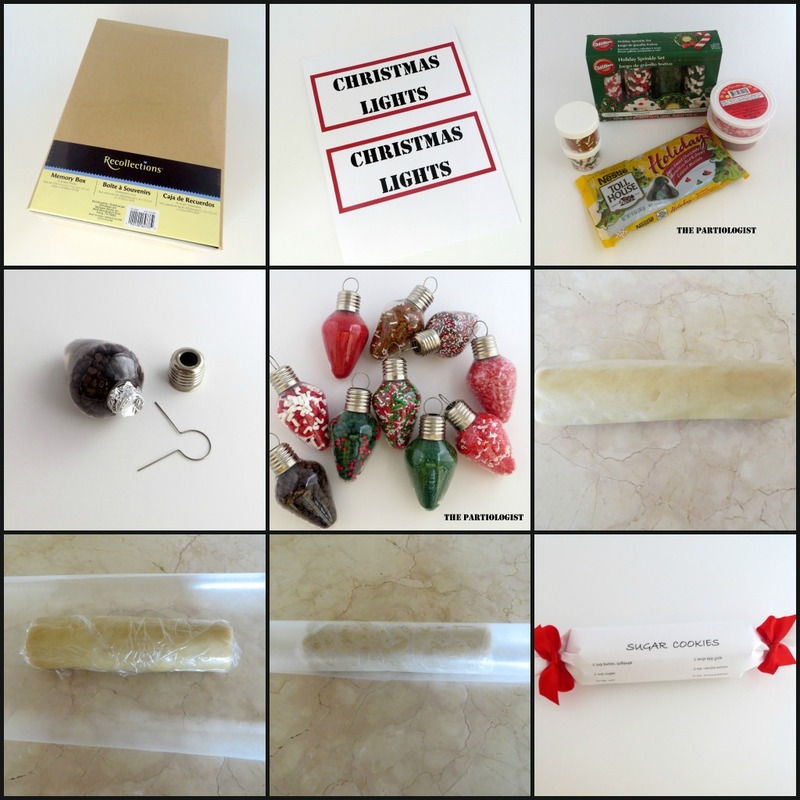 I don't want to leave you without a couple of gifts to make for your friends and family. You know they think you're crafty don't you? So with a little help from your favorite Elf, you can make these treats in no time at all. 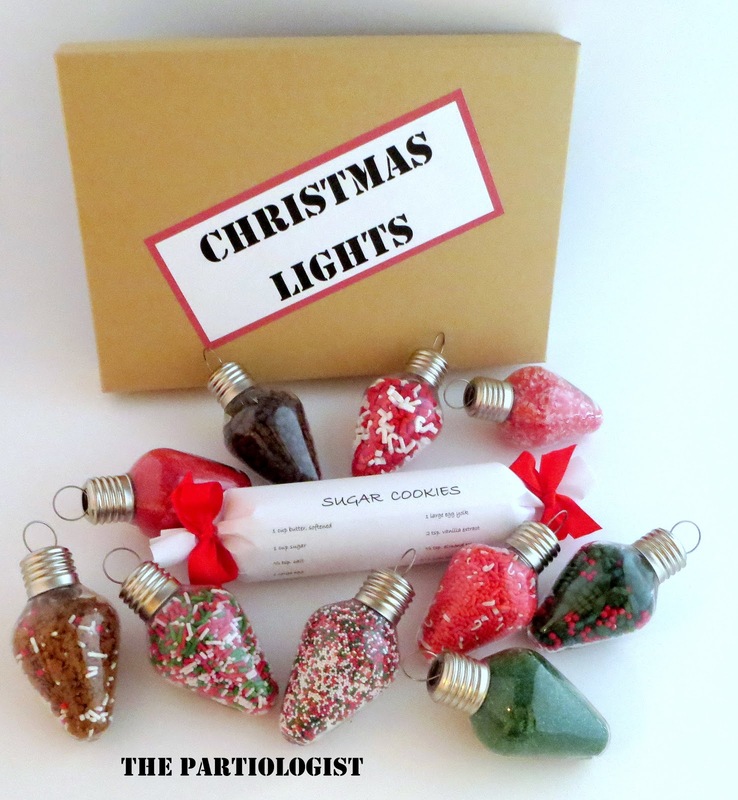 Here is a little information about the light bulbs I used to fill with the cookie decorations. They are PLASTIC craft bulbs which I found at Joann Fabrics. If you look early in the season Joann Fabrics has them stocked. Before we fill the box with cookie dough and sprinkles, let's fill it with cookies! And I'll show you a cute way to package them. I found the photo box at Michael's and thought it would make a great storage box for Christmas lights. Package the lights individually so they don't break. Christmas Lights are very fragile. Do I hear some of you saying, I don't have time to make Christmas Light cookies? Have no fear, your favorite Elf is here. Let them make their own sugar cookies!! You can buy it all! Who ever said you can't buy happiness? The clear plastic lights were empty plastic Christmas craft ornaments and I filled them with Christmas cookie decorations! And I rolled sugar cookie dough in a log. (My mom used to do this all the time with every kind of cookie dough - we could just slice and bake). YAY mom! Print on white adhesive paper and cut. 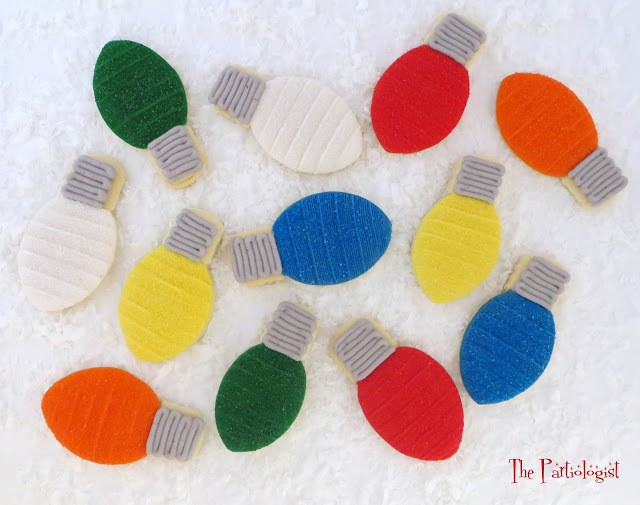 Plastic Light Ornament - Fill the ornament by pouring the decorations on a paper plate. Fold the plate like a taco and pour sprinkles into the ornament. Close the top with a small piece of foil. Roll your cookie dough in the shape of a log. Then covered with wax paper. Be sure to keep dough refrigerated or frozen until giving. I'll leave it to you to either make or buy the sugar cookie dough. I won't tell. What an amazing Christmas gift either of the boxes of light bulbs would be for friends and family. I love the idea of putting sprinkles, etc. in the plastic light bulbs. So clever and fun! LOVE, LOVE, LOVE this! !The label is absolutely perfect - gosh, I just love it! 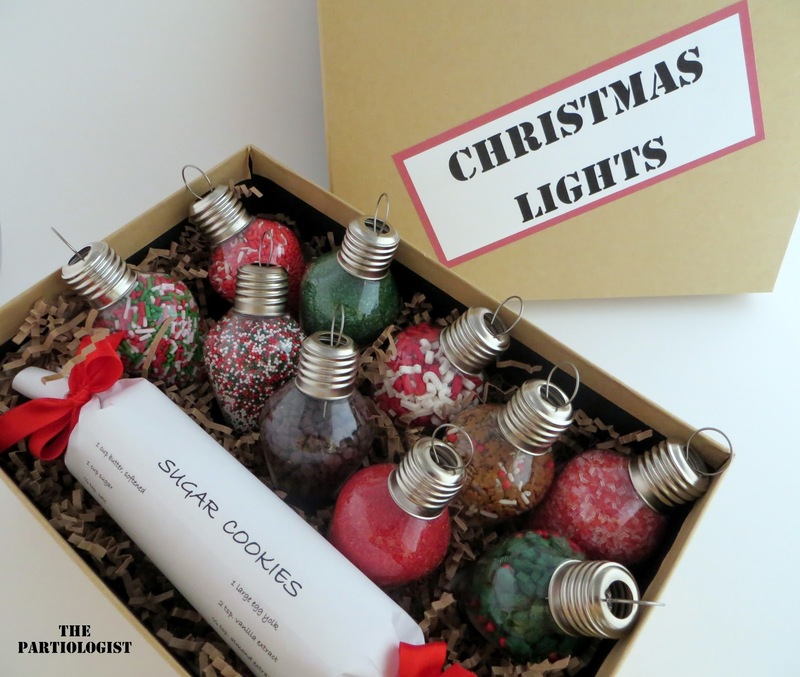 The box of decorated light cookies is very sweet but the box of decorating goodies in plastic light together with the ready made dough and recipe is just brilliant! This is a "Bright Idea" indeed!! LOVE the lights with the decorations in it! I am so going to do this next year!!! Thank YOU!!!! I really like this idea, but the basket has to stay refrigerated until gifting time rolls around or else it will go bad. But this is truly an epic idea! Oh yes, the dough must be kept refrigerated before giving. I actually put the cookie log in the freezer and will just pop it in the box before giving. I will go and add that - thanks! This is such a great gift idea!!! What a great idea! So unique and cute, thanks for sharing! I checked with JoAnns and they don't have the light bulbs anywhere. Do you have another possible source and can you tell me what I might google? Try this instead...change the label on the box to "Christmas Ornaments" and use clear ornaments to put the sprinkles in, and if you bake the cookies, make them into ornaments too, instead of light bulbs...just a suggestion if you can't find the light bulb ones. I also found a link for the ornament bulbs and listed it above! Thanks for your suggestions - I love them! Hi, I love this idea, thank you! I also couldn't find the lights and was trying to change the text in Adobe to say "Christmas Ornaments", but I can't manipulate the text. Am I doing something wrong? Or would you mind sharing the font with me? Thanks! The text cannot be changed, however, I will try and find the name of the font for you! Hobby Lobby had the light ornaments in their Christmas glass section this year (2015) They may be sold out by now though. Amazing idea!! I love it!!! What a fantastic idea ....I specially like 2nd one. I was thinking since I'd be sending them to grandkids out of state....wouldn't want the cookie dough to spoil... so maybe just packaging the dry ingredients in the same way....w/ the recipe card telling them which wet ingredients to add? Just my 2 cents worth! Thanks for posting this fun idea! That is a great idea! You could also add cookie cutters to the box! There is a link above to order from Amazon if you cannot find them at Joann Fabrics. Check Wal-Mart too if you have one close by! so on the dough what is it made of if the printable has what they need to add?? or is that just for looks? The link for the Sugar Cookie recipe printable is the entire recipe. They need to add nothing, it's mostly for looks or if they want to make more dough, they have a recipe! Thank you so much for sharing Jill! You can also g on line at Hobby Lobby y have them for a dollar + shipping. Awesome, the final gift I just couldn't come up with. Here it is, thank you!!! Thank you Kristin - glad you found the gift! Thanks for this great idea !! I just went out and bought some bulbs at Wal-Mart but they look kind of big for 10 of them to fit in the box with the cookie dough. I am going to try and put some in the Michael's box... I wonder if anyone sells smaller ones... Also a lot of sprinkles to put in each bulb.....Maybe I got the wrong ones..... I can't wait to make these for friends. I do think the bulbs at Wal-Mart are a bit larger then the ones from Joann Fabrics. Maybe don't put as many in the box and fill in with some Christmas cookie cutters? Amazon is out of the light bulb ornaments and they don't know if they will get anymore. I have checked various sites but no luck. I ordered the ornaments just to be on the safe side. I love this idea. Maybe you'll be able to find them at the craft stores - fingers crossed! I can't make out the name on the brown paper. Also where do I buy this and what kind of box did you use. Thanks! I think the brown paper you're referring too is actually the brown photo box. The box came from Michaels. It would also be cute to fill the plastic ornaments with single servings of homemade hot cocoa mix. sunshinecrafts.com There are several varieties of fillable plastic ornaments. The ones pictured above are $1.29/each. Shipping is quite high though. I see them again this year at Joanns, hope you can find them. I'm in San Diego and can't find them at Joanns and have checked online. Sunshinecrafts seems to be out of stock. Anyone having any luck finding these ornaments this year? I'm so sorry you're unable to find the ornaments. What about getting a 12-pack of little round clear plastic ornaments. I've seen them at most craft stores in a set, round and two sizes. The smaller size would be the perfect size for the sprinkles. I'll try and find an amazon link as well. I am having trouble loading the recipe. Any ideas? I just checked the link and it looks like the view of the recipe in the thumbnail is partly blacked out, but when I downloaded it to print, it looked fine. Give it a try and let me know if it works! I saw this shared on Facebook today and was delighted to see the link came back to you! This is SUCH an adorable idea Kim!! Love it! 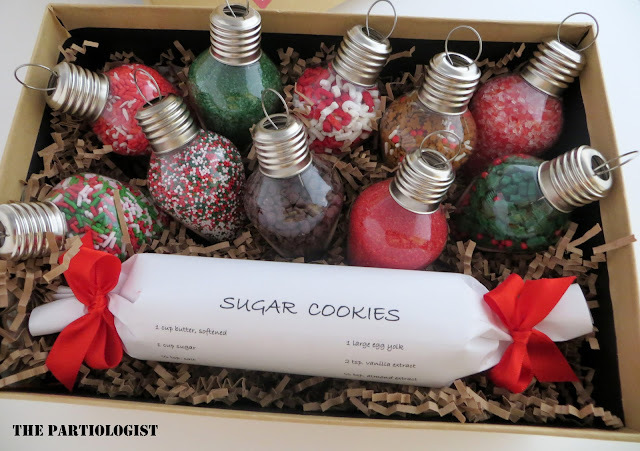 Maybe make the dough and give just two ornaments filled with candy? A dozen ornaments would give 6 gifts. That's a great idea! Always check for coupons at Joann fabrics too. Does anyone know how long a roll of refrigerated cookie dough is? I'm cheating and buy mine instead of making homemade.....ssshhh. Found the ornaments at JoAnn's - on sale already for 50% off. Looking forward to doing this next year. SCORE! I love those 50% off sales! Love this idea & am thinking about this as office gifts for work. Instead of buying the store bought dough, I'm thinking about putting the dry ingredients into a Christmassy zipper sealed bag, then rolling it up & putting the wrapper onto it with the recipe printed on the outside. That sounds like a great idea, your co-workers will love it! okay I may be special but do you have to put all of those sprinkle light bulbs in the gift box? Wont that get kinda expensive? Cause I see you have many bulbs in the box otherwise excellent idea! There are so many options for this gift box, maybe add two rolls of cookie dough, use a smaller box, even add cookie cutters to the box. Even fill the bulbs with crushed Oreo's, mini marshmallows, etc. So many ways to bring the cost down. :) Hope this helps!